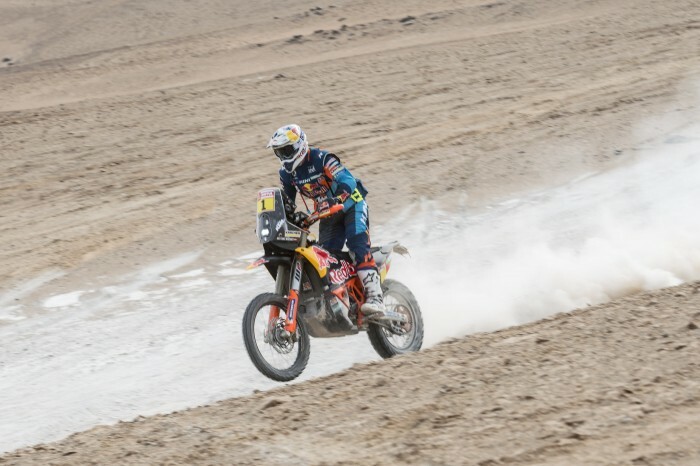 Red Bull KTM’s Matthias Walkner suffered a suspected broken ankle during an incident on stahe four of the 2019 Dakar. Walkner was the 15th rider to enter the day’s timed special. Immediately pushing hard and making the most of his experience to catch and pass riders ahead of him, the 2018 Dakar Champion maintained his strong pace throughout the day on the fast, treacherous route. A heavy landing from one drop-off caused the injury but the Austrian rider was able to continue to complete the stage and finish as runner-up. “My ankle feels quite hurt. Fifty kilometres before the end I did a big jump and landed heavily. First I was thinking, ok, maybe it’s broken,” said Walkner.